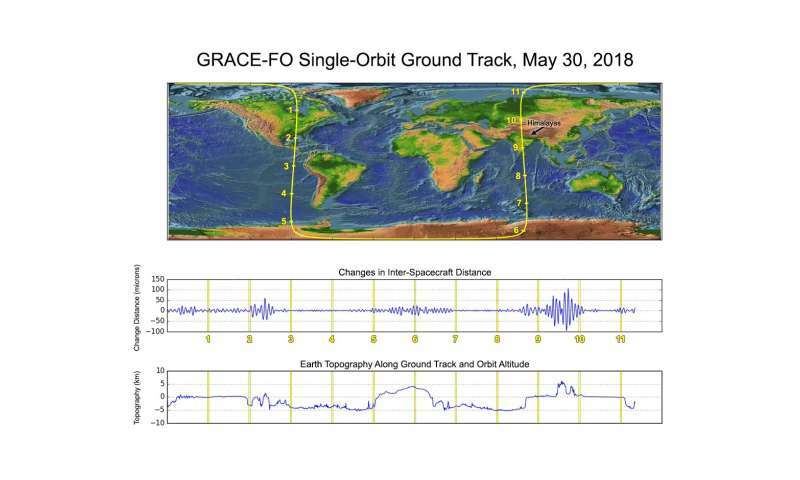 During the initial phase, the twin GRACE-FO satellites were maneuvered into their operational orbit formation approximately 137 miles (220 kilometers) apart. Spacecraft systems were powered on, checked out and found to be performing as expected. Engineers also activated both primary instruments: the accelerometers, which measure forces on the satellites other than gravity, such as atmospheric drag or solar radiation pressure; and the microwave ranging instruments, which precisely measure the distance changes between the two satellites as they orbit Earth. Variations in Earth's gravity field caused by changes in the distribution of Earth's mass on and beneath the planet's surface—such as groundwater withdrawal and ice melt—cause the distance between the two satellites to vary ever so slightly. The GRACE-FO microwave ranging instruments allow distance measurements with a precision better than one micron—less than the diameter of a blood cell, or a tenth the width of a human hair.